Traveling is one of the best investments you can make. 1. Spending on vacations is better than spending on toys. Rather than spending on an expensive new toy for your child and finding he’s bored with it a week later, use the money for travel instead, psychologist and best-selling author Oliver James told The Telegraph. "Family holidays are valued by children, both in the moment and for long afterward in their memory. So if you're going to spend money on something, it's pretty clear which option makes more sense." Aside from making memories and being wise about where you spend, travel is better for family bonding. Where new toys, like screens and gadgets, put distance between family members, travel brings them closer together. It's all about "talking nonsense with your parents, sharing an ice cream and moments of time in which your interests are genuinely taken into account," says James. 2. Travel is beneficial to your child's brain development. "What is less widely known is that holidays can also advance brain development in children," Dr. Margot Sunderland, a child psychotherapist and Director of Education and Training at The Centre for Child Mental Health in the UK, said in another article for The Telegraph. When you go exploring during a family vacation, whether it's in nature or a heritage town, you activate many critical areas of the brain, particularly the "play and seeking systems" that typically go unexercised at home, says Dr. Sunderland. "[This] brings about brain growth and maturation in the frontal lobes, the very part of the brain involved in cognitive functioning, social intelligence, and well-focused, goal-directed behaviors that may last a lifetime." 3. Both parents and kids need to de-stress. Adults aren't the only ones who experience stress from the pressures of everyday life. In a 2015 survey of 754 kids, researchers found that 79 percent of 8- to 14-year-olds say they regularly experience stress. On the other hand, 77 percent report feeling no stress when their parents take a break from work to spend time with them. "Parents who want to help their kids reduce stress should consider using a vacation day," read the report. Dr. Lotte Bailyn, professor emerita at the MIT Sloan School of Management in the US, agrees. "Good relationships emerge out of simply having interactions with the people in our families under conditions that are not highly stressed." 4. Memories from family vacations can act as "happiness anchors." Did you know that the UK has a national charity that helps struggling families go on vacation together? 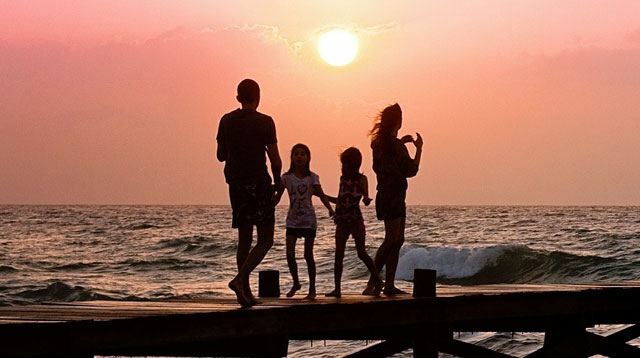 It's called the Family Holiday Association, and in 2015 they conducted a study that sheds light on the long-term benefits of family vacations. The happiest memory of 49 percent of the British people surveyed was on vacation with family. A third said they can still vividly remember family vacations from their childhood. What's more, a quarter brought up these memories to get them through tough times. "We consider these to be a 'happiness anchor'—reflecting on our happiest memories of joyful time spent together as a family can be extremely powerful in bringing relief and respite when faced with the darker times that life can bring," John McDonald, director of the Family Holiday Association, told the Huffington Post. 5. Taking pictures can make you happier. We don't need a study to tell us that looking at our family photos is happiness. But if you want to know research from the Yale School of Management found that "the act of taking pictures (whether it's on a bus tour or eating out at a restaurant) boost people's engagement with and enjoyment of whatever activity they're participating in." That is, as long as picture taking is not intrusive to the actual activity, the study notes. So you can take as many photos of the kids as you want on vacation, but remember to put down the camera as well. You can't fully experience an activity or a simple moment if your eye is always looking at the camera. So, whether you need to ride a bus or car, or fly on a plane, know that travel as an investment is worth it.